Sometimes fall comes early. Sometimes it appears to be happening year round. alkaline conditions. It might as well be cut down. Chlorosis is an abiotic (not related to insects or diseases) condition in plants where leaves lose color and turn yellow often with green veins left. It happens primarily on the newest growth first. This discoloration is often diagnosed as “iron deficiency” followed by the recommended solution of iron and sulfur products. Like most purely chemical recommendations, this is not very good advice. Iron availability may be an issue, but it may not be the only deficiency. Chlorosis is often a deficiency of many elements – iron, magnesium, manganese, zinc, molybdenum, and other trace minerals. One of the most common causes of chlorosis is the heavy use of high-nitrogen synthetic fertilizers. The key to solving this problem in many cases is to stimulate the biological activity of the soil so that the “tied-up” minerals are “released” and made available to plants. The overall solution to the problem is to apply the entire Sick Tree Treatment and add Epsom salts or sul-po-mag if magnesium is deficient in the soil and that is the case in many soils. And of course, go organic. Greensand can help by itself because it contains many trace minerals including iron. By the way - greensand is the only iron supplement I recommend. There is one more possible reason for the yellow chlorotic leaves on plants and it is a common problem. Many red oaks are not adapted where they have been planted. 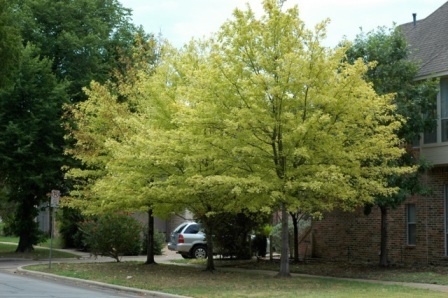 The most common culprit here is pin oak and mix-breed red trees being planted in alkaline soils. Pin oaks are great trees – but must have acid soil. They do best in sandy acid soils like those in east Texas, Oklahoma, and much of the eastern U.S. They will not grow well or even survive long term in alkaline soils like the black and white soils of north and central Texas except for those rare sandy spots that are primarily old waterways. What’s the solution for these ill-adapted trees? Don't plant them unless you have the right kind of soil. Even if you change the soil pH with vinegar, which can be done, you’ll still have to deal with the alkaline conditions of the irrigation water. Pin oaks are sometimes hard to identify but here’s some guidelines. They have a stiff overall appearance usually with a strong, straight central trunk. 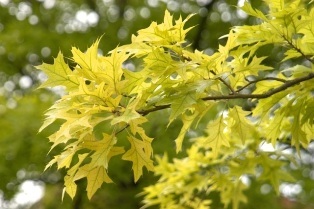 They are generally upright, pyramidal shape, especially when young, spreading with age and have red oak type leaves and usually a weeping nature, especially on the lower limbs. Texas red oaks have more of an upright candelabra effect. 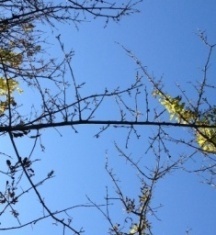 The most important characteristic is the presence of small pin-like twigs. Classic look of chlorotic leaves with green veins. To make this problem even more difficult, oaks (especially red oaks) are very promiscuous. They naturally cross breed like crazy, and when the red oaks being sold are heavily crossed bred with the “blood” or genetics of pin oak, northern red oak, southern red oak and other trees suited to acid soils, they will never be healthy in alkaline (high pH soils). Solution? 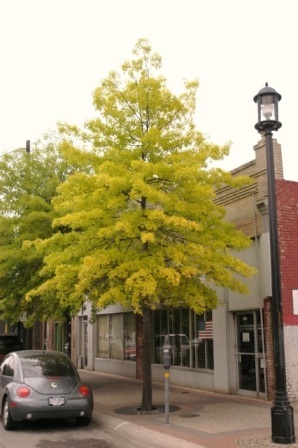 Take the ill-adapted trees out and plant natives and well-behaved introductions that like the alkaline soils. 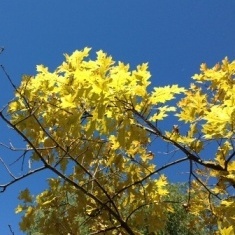 Early fall color of pin oak in alkaline soil. Pins of the pin oak. are still strongly crossbred with pin oak as is evident. Additionally, bald cypress trees have the same issue from a little different standpoint. Bald cypress propagated from trees grown in acid soils in Louisiana for example will often be chlorotic and yellow when planted in alkaline soils. The exact same species propagated from trees growing in alkaline conditions will be dark and have no problems in the high pH soils – especially under organic management. If you have any questions on this newsletter or any other topic, tune in Sunday 8 am -11 am (CST) to the Dirt Doctor Radio Show. Listen on the internet or find a station in your area. The phone number for the show is 1-866-444-3478. Please share this newsletter with everyone in your address book and all of your friends on Facebook and Twitter to help me spread the word on organics.